Reduce Your School’s Environmental Footprint! Many school systems across the country are finding ways to cut back on consumption and teach their students tips on being environmentally concious. The Virginia School Plant Management Association (VSPMA) is taking new steps in creating Green Ribbon Schools in Virginia. There are many ways teachers can invoke eco-friendly reminders and tips for their students. Here are a few ways kids can learn at an early age, the importance of reducing their carbon footprint. 1. Assign textbooks for students that are issued from green publishers that print on recycled paper or avoid endangered forests. 2. Make art projects using old items such as used CDs, paper towel rolls, holiday cards and egg cartons. 3. Promote reusable water bottles. Institute a policy where children are encouraged not to bring in plastic water bottles to class that would be wasted after empty. 4. 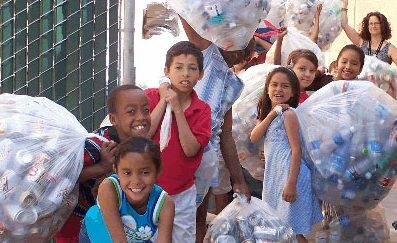 Place recycling bins in classrooms to focus on importance of what materials are to be recycled verus thrown away in a landfill. 5. Keep students up to date! Create lesson plans that focus around imporant facts and information that students should know about the environment. Introduce programs such ast “The Green School Initiative” and have students sign the pledge! Push your school to achieve Green Ribbon status! President Obama developed the Green Ribbon Schools program because of his commitment to reducing greenhouse gas emissions. The Green Ribbon Schools Program is modeled after The Blue Ribbon Schools program, but focuses on environmental standards versus academic.